The 1st Annual Boyd Coddington Garage All Speed Expo was held at the KCI Expo Center in Kansas City, Mo. on Nov. 21-22, 2015. During the trade show and car show there was also a Pinup Contest on Saturday. Venders from all around the Midwest attended the event. Some of great custom and classic vehicles were display. Because the event was held indoors it was a welcome escape for spectators to get out of the 30 degree weather outside. Everyone seem to have a good time. 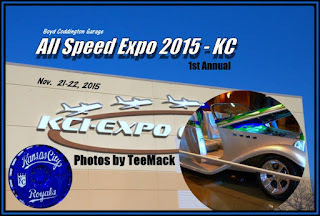 Click here to view photos of the All Speed Expo.